Well, y’all, it’s here. The Week of Eating. Which for me is generally followed by The Month of Eating (Christmas Cookies and Hot Cocoa), concluded by The Big Christmas Feast and then repeated once more by The Big New Year’s Feast and then finally, finally, I am worn out. Mostly. 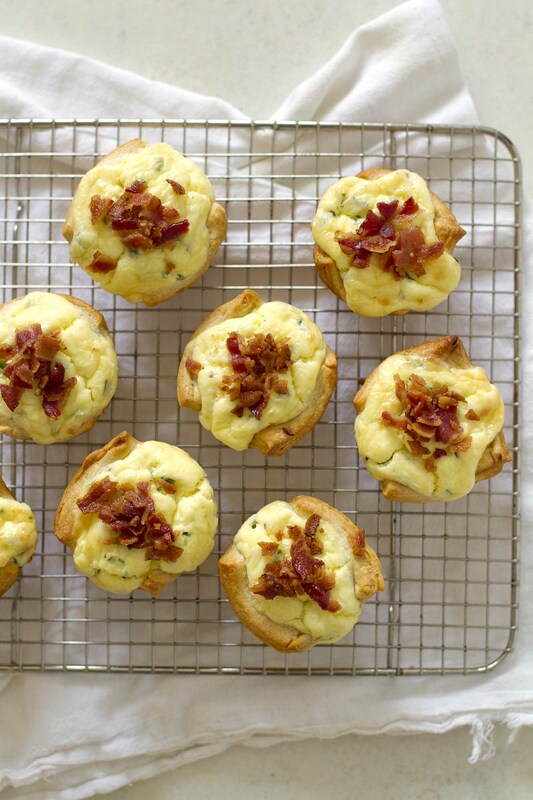 So we should do this thing right and kick things off with a hearty breakfast/brunch of bacon quiche crescent cups, amiright? I hope you’re more in the I Love Bacon camp and less in the Seriously, More Bacon? camp as this is, in fact, the second recipe in a row in which I have featured the ingredient. In our house, bacon is a regular staple, now more than ever since our two-year-old has discovered it and realized what she’s been missing all of her little life (a la Ted Mosby in HIMYM). It’s not like we eat it daily, let me assure you. 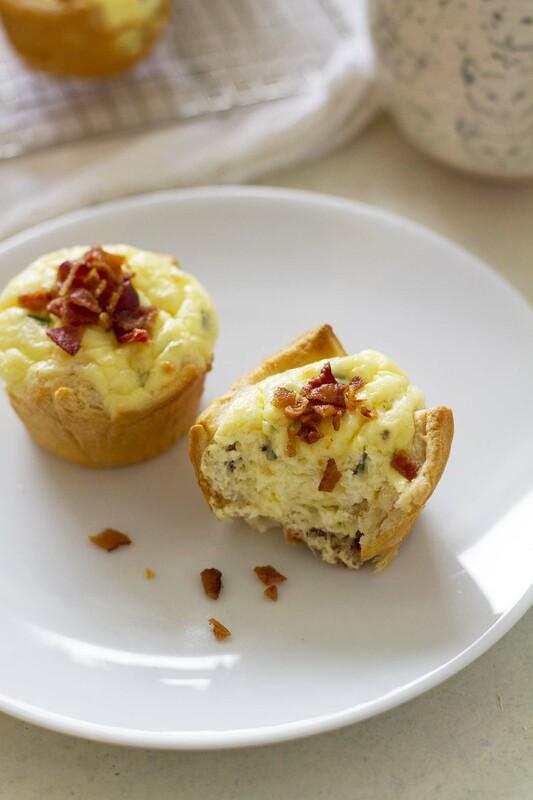 But we like to have it with our weekend breakfasts or in BLTs or in salads or in these bacon quiche crescent cups, which have a double layer of bacon. Ahem. But let’s talk more about these cups, shall we? 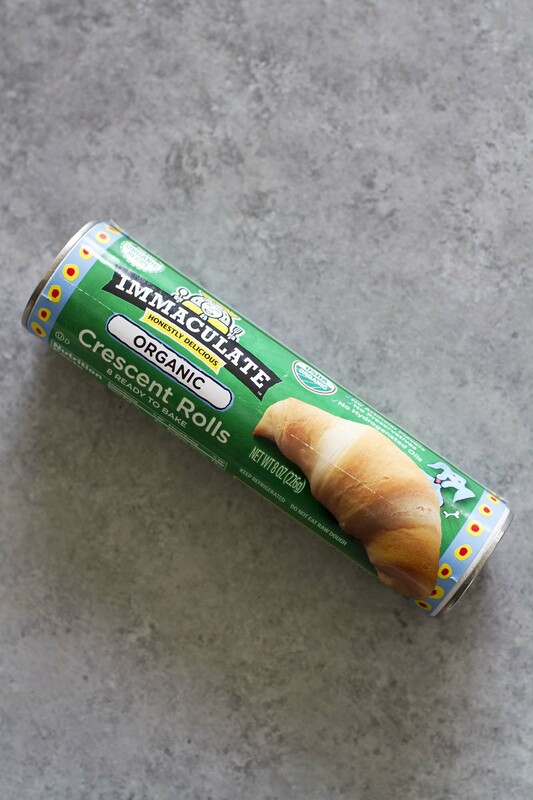 You start with buttery soft Immaculate Baking organic crescent roll dough, cut it into squares, press those squares into muffin cups and fill each cup with bacon, a creamy cream cheese quiche filling, bake it and top it with more bacon. That’s it. So simple. So tasty. So perfect for Thanksgiving Day brunch or Day-After-Thanksgiving-Day brunch or any breakfast this week when you need to run out the door but really also need to have some quiche. And bacon. The tot and I are starting our holiday vacation early by flying down (just the two of us, pray for me) to my parents’ house tomorrow to help prepare for the festivities (the husband is meeting us there on Thanksgiving). I think my contribution will be breakfast, and these crescent cups will do nicely. After that, my contribution likely will include a lot of eating of the food. FOR THE BABY, obviously. 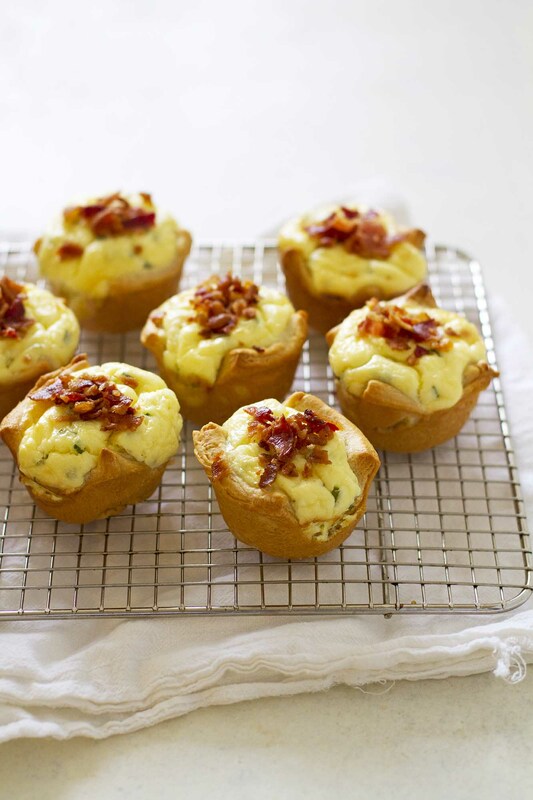 If you’re in charge of breakfast at all on this glorious Week of Eating, may I suggest baking up these cups of bacon-y, quiche-y goodness? If you’ve got anyone in the I Love Bacon camp in your family, these won’t disappoint. Heat oven to 375 degrees F. Spray 8 standard-size muffin cups with cooking spray. Unroll dough into rectangle; press seams to seal. Use pizza cutter or sharp knife to cut dough into 8 equal-size squares. 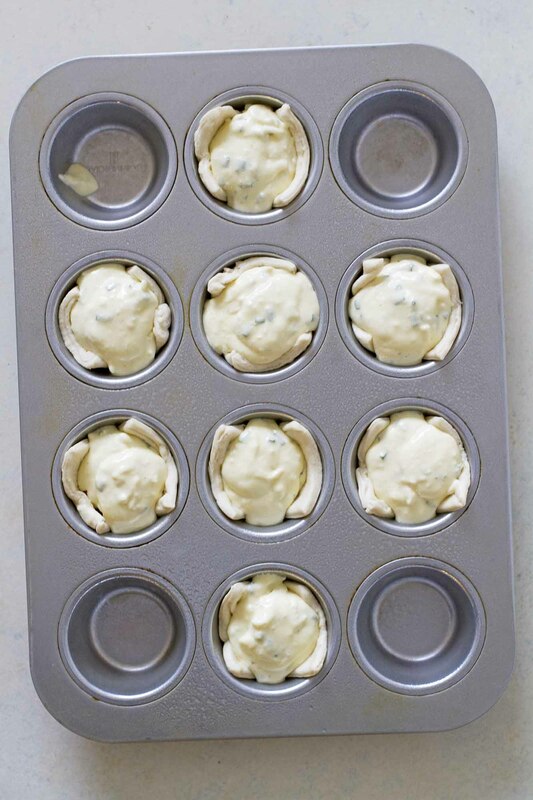 Gently press each square into bottom and sides of prepared muffin cups. 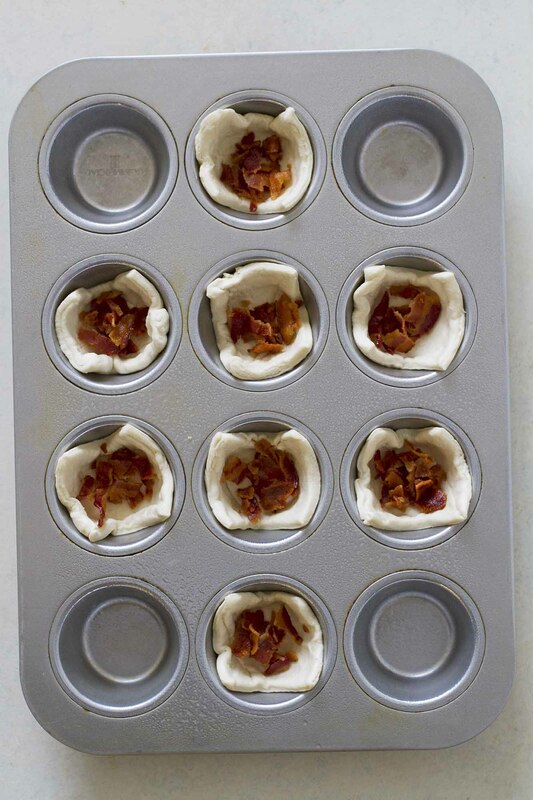 Sprinkle half of crumbled bacon into bottom of each cup. In medium bowl with electric hand mixer or stand mixer, beat cream cheese until smooth. Add cream, eggs, cheese and chives; beat until just combined. Spoon enough of cream cheese mixture into each cup to reach edges of crescent dough (you may have a little cream cheese mixture left over). Bake 20 to 25 minutes until filling is set and edges of crescents are golden brown. Cool 1 minute in pan; transfer to serving plate. Sprinkle remaining bacon on top. Serve warm. Next Post » happy thanksgiving. Perfect for quick breakfast on the go. But I will definitely be using this one for Christmas Eve Brunch! Thank you! Oh, yes please! I have a feeling these cups would be perfect for Thanksgiving brunch! That is such a smart idea! It looks entirely tasty, I have a feeling these mugs would certainly be ideal for Thanksgiving breakfast! Laura — For sure! Happy Thanksgiving, love! Emma — Thanks so much! These are great! My 4 year old daughter can’t get enough. Tip if you have a cruddy hand mixer , warm the cream cheese with the milk in the microwave first. I did 30 sec 2x then mixed it up. I also tried it with ham too. All around delicious. Thanks! Excellent recipe! I made these Saturday for a “Thanksgiving leftovers challenge” dinner party side dish and they were a hit! I used diced salami and raw yellow squash leftover from my appetizers and the cream cheese and eggs leftover from a pumpkin cheesecake. I’ll be making this again since it can support endless filling combinations! These are great! We used a larger muffin pan which made them a breakfast entree instead of an appetizer and they were soo good. We did use some onion and chive cream cheese. Also the bacon was grilled yesterday in advance over charcoal. Thank you! What a perfect combination. Bacon, cheese and egg. What could possibly go wrong? I will add some sausage cubes too!